We arrived in Lewiston on Tuesday, got familiarized with the town, had some dinner, and went out to the test stage on Wednesday. It was obvious that the EcoBoost had way more “get up and go” (low end power) than the plus-spec R1 we raced at LSPR last fall. The bad news is that the 1.0L is a turbo car, a major downside on the ice. We experienced plenty wheelspin throughout our time in Michigan. We got registered for the event, got our visual package, lost our visual package, went over what was in the car for our use, changing tie rods… Recce on Thursday moved along nicely and we decided to do Friday’s press stage/shakedown. 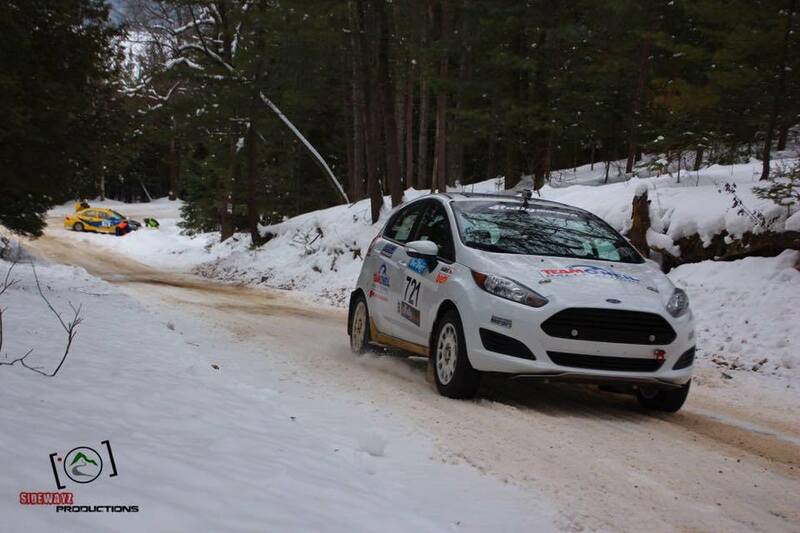 Shakedown was great; a fast stage with lots of snow and nothing like any of the rally stages. FCO was at 4:30 on Friday afternoon. We had a bit of light for the first stage, but pretty much had our lights on after that. The first leg was Meaford-Mills, East Branch +, and Huff-Old State (6.5, 16, and 9 miles, respectively, with very short transits). I expected SS1 to be extremely slick, but it wasn’t. The slippy corners were very slippy, but other than that, there was lots of grip. SS2 was pretty grippy for the most part as well, and I found some places to pick up the pace the next time though, along with finding that most of my braking points were way too far back. SS3 was a “trust the notes” stage, and it went well. About 7 miles into Huff, we came over crest to find Bailey and Kremer off, and the one triangle that was out had been hit. We (barely) made it around them and hoped that everyone behind us would be able to avoid them, too. We then had a forty-five minute service and set out to do it all again. SS4 was how I expected SS1 to be… slick as hell. On SS5 we encountered cars on stage more than we would have liked, and lost a bit of time slowing down for stopped cars, and later again to let said stopped cars pass once they had been freed and caught up. At the end of the second leg, with Cameron having been in the bank and both Ryan Millen and Steve LaRoza having been off earlier in the evening, we were winning 2WD and we posted a time only 10 seconds behind Lauchlin on the last stage (just kidding… there was a timing error which mysteriously shaved 3 minutes off of our time, but with time adjusted and Cameron’s plan to super rally factored in, we were still in the top 3 for 2WD). The next morning, on SS7 (Orchard-Shoreline) I took it easy and noted that there was plenty of grip among the 4s. SS8 ended up being my favorite stage of the rally (Hunters-Agren). I dropped 40s each off of SS7/SS8 times the next pass through. 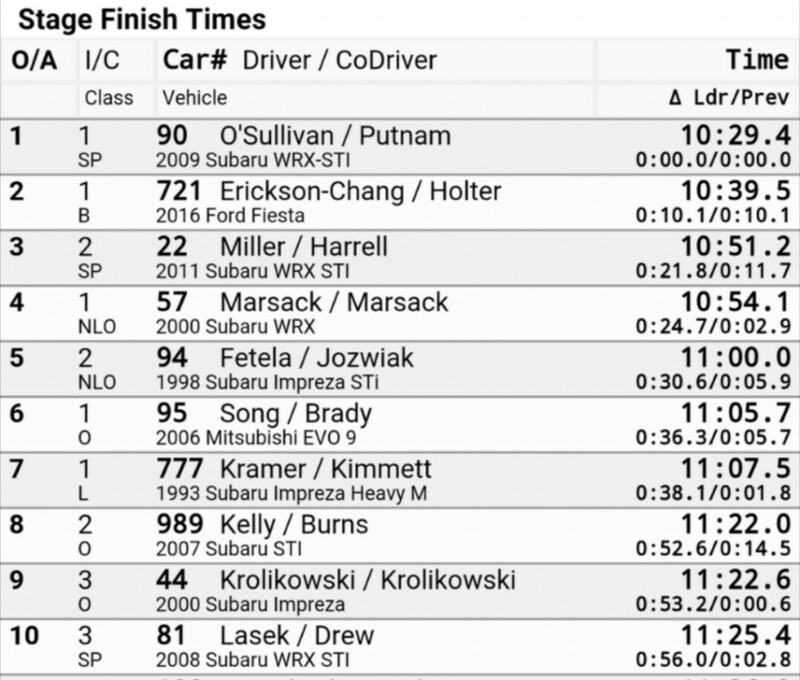 SS9/12 was the super special, and after knocking 5s off of my first pass (on a .85 mile stage), we posted the second fastest 2WD time. 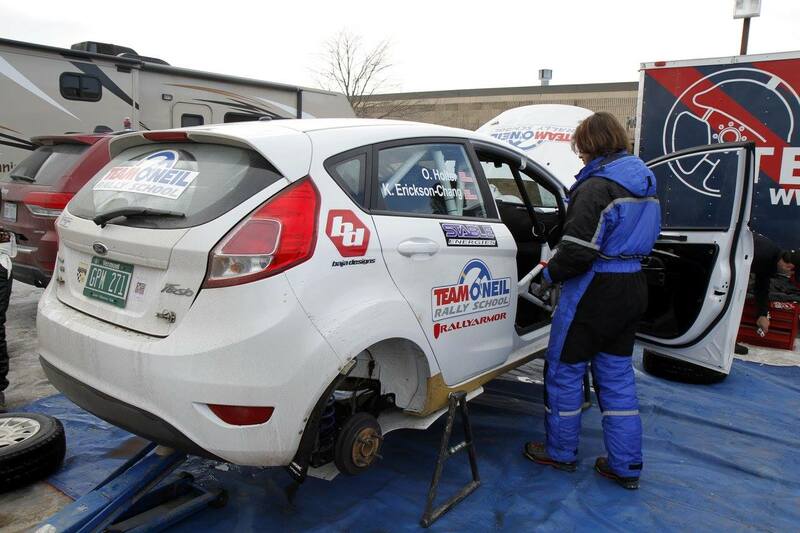 At our second, and final, service of the rally, there wasn’t a whole lot to do. We declined fuel and kept on. SS13 was Hungry 5. We were told at the start that Lauchlin had gone off but everyone was okay. I assumed after recce that Hungry 5 was going to be my favorite stage, and while it wasn’t, it was up there. I just wish it were a little longer! In other news, Troy Miller had earlier had a flat, which Lauchlin stopped to help with, saving Troy from a late penalty. Troy returned the favor and offered Lauchlin a tow, but they weren’t ready, and by the time everything was done, Fetela had caught up and Troy, given up his lead. SS14 was Blue Lake-Halberg and it had the only delay we saw during the rally. There was word of both spectator issues on stage and the possibility of Scott Putnam needing a bit of medical assistance for a cut. We ended up having a half-spin on stage and, while we stayed on the road, lost a bit of time getting turned forward. I also stalled the car in one of the hairpin lefts, and for some reason, couldn’t get the car started again right away. But at least we stayed on the road. We returned to service for the fuel-only stop, got a few gallons, and set out on the last leg. On recce, Ole mentioned that it was maybe rougher than he had ever seen it before. He’s done Sno*Drift somewhere around 15 times. I really liked the roads, the first section in particular. But on stage, I couldn’t wait for it to be over. 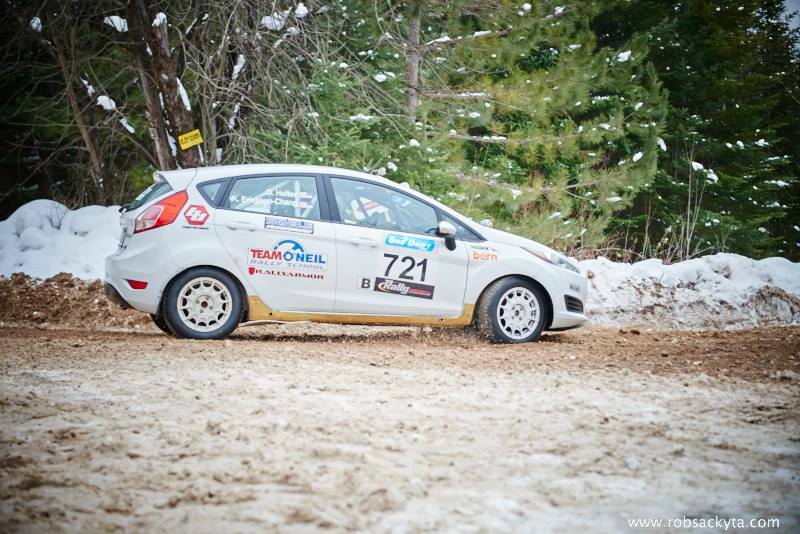 There was too much snow, and we had gone with tractionized ice tires for the entire event, which didn’t help. The warmer temps of the day had made the snow a little too heavy, to the point where it starts grabbing and pulling. The cooling temps made it slicker than it looked. First gear? Useless. Second gear? Insane amounts of wheelspin. Third gear? Too high of a gear for everything but the fast stuff. Justin Kollien passed us on stage, and then we both passed the car ahead. Our finish time was pretty solid despite how difficult it was. I told Ole that the conditions were way worse than I had expected it to be, and he later said the same thing. We took Blue Lake even slower the second time, but it was an extremely clean run and got us ready for the last stage, iconic Bonfire Alley. It was the most spectators Ole had ever seen. Since conditions had been so slick, I remained conservative as there wasn’t much to gain, but could have picked up the pace quite a bit. There are few things to look out for, and most of the stage is really fast. In the end, it was quite the experience. It might have not happened on the first try, but I finished my first rally, and it was Sno*Drift. My goal was no punctures and no getting stuck in the snowbanks, and we achieved it. I set strict boundaries on how I would drive (6 or 7/10ths) and we did pretty well. 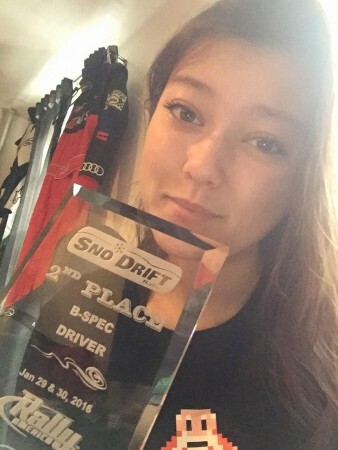 We broke top three 2WD, finished fifth in 2WD, and 2nd in B-Spec.